(Nanowerk Spotlight) Constructing molecular machines with controllable movements has been an important goal in chemistry and nanotechnology and the pioneers in this field have been recognized with the Nobel Prize in Chemistry this year. In terms of development, the molecular motor is at the same stage as the electric motor was in the 1830s, when scientists displayed various spinning cranks and wheels, unaware that they would lead to electric trains, washing machines, fans and food processors. Molecular machines will most likely be used in nanomedicine and the development of things such as new materials, sensors and energy storage systems. One way to construct useful molecular machines is to combine natural molecules – such as proteins or DNAs in our body – with synthetic molecules in order to control the functions of the natural molecules. Building on previous work that allowed to achieve complete control over on/off switching of the movement of a nanomachine, researchers in Japan have, for the first time, developed a molecular system which allows free control of the motion of single microtubules. This new work from Professor Nobuyuki Tamaoki's laboratory at Hokkaido University has been published in the October 21, 2016 online edition of Lab on a Chip ("Spatiotemporal control of kinesin motor protein by photoswitches enabling selective single microtubule regulations"). Related work has been published earlier this year in Organic & Biomolecular Chemistry ("Structure–property relationships of photo responsive inhibitors of the kinesin motor"). The microtubules, tube-like structure with measuring 25 nm in diameter, could potentially serve as carriers of various molecular cargoes in future nano-transportation systems. 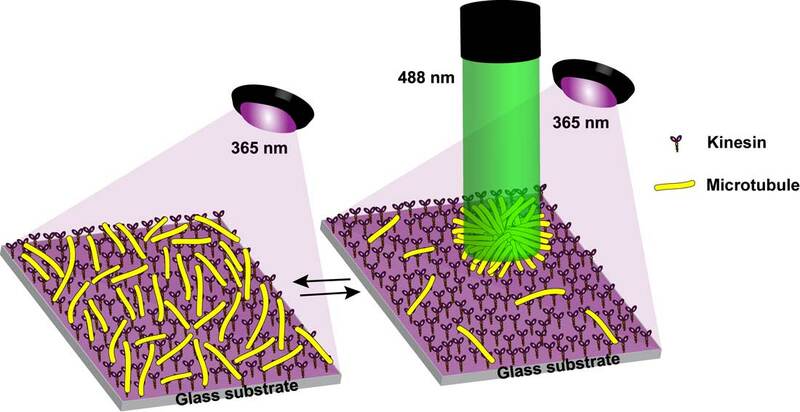 "We have demonstrated the controlled local concentration and dispersion of microtubules at any desired position and time without the need for any surface patterning," Tamaoki tells Nanowerk. "We have performed several selective and specific regulations of single microtubules, including transporting, bending, and breaking, all under the influence of light." The key to this work was the synthesis of a photo-switchable inhibitor for the motor protein kinesin, which propels the microtubules by using the energy of ATP. In addition, the researchers have developed a new illumination setup – emitting at two different wavelengths at the same time – which deactivates the inhibitor precisely at the location of a target single microtubule and activates the inhibitor in the surrounding area to stop all other microtubules. "Our strategy was to use a reversibly photo-switchable molecule – azobenzene – for solving the diffusion problem," notes Tamaoki. "If the azobenzene structure is introduced to the inhibitor molecules via a covalent bond, the inhibition property is reversibly switched by the photo-isomerization of azobenzene through the illumination of light at the suitable wavelength selected from blue or near ultra violet. The defusing deactivated inhibitor molecules from the target microtubule's site are photochemically activated again by the blue light immediately after reaching the surroundings." Although the researchers can now control the speed of single microtubules at any moment by photo-irradiation, it still is difficult to change the direction of the movement by light. At the moment, in order to change the direction of a microtubule they need to prepare in advance its path. Therefore, their next goal is to develop a method to change the direction of the movement of microtubules by photo-irradiation as well. In the present work the team uses kinesin-1. However, among the kinesin family there are other proteins that are target molecules for anti-cancer drugs. Tamaoki believes that the concept of photo-responsive inhibitors can be applied to the targeted drug delivery for cancer therapies. "In future nanomedical application we could envisage that the inhibitor function is switched on at the cancer cell sites by the irradiation at the suitable wavelength while at healthy cells' site the inhibitory activity can be ceased by light at the other wavelength," he says.